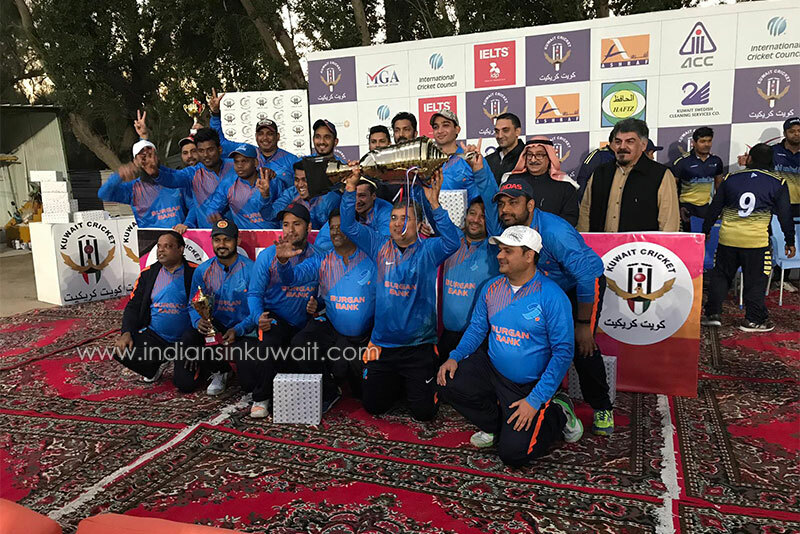 In Jan 2019, Kuwait Cricket held the grand finals for the KBC T-20 Trophy, sponsored by KBC at the Doha entertainment city ground. This is the first tournament of the 2018-19 season for the banks league. 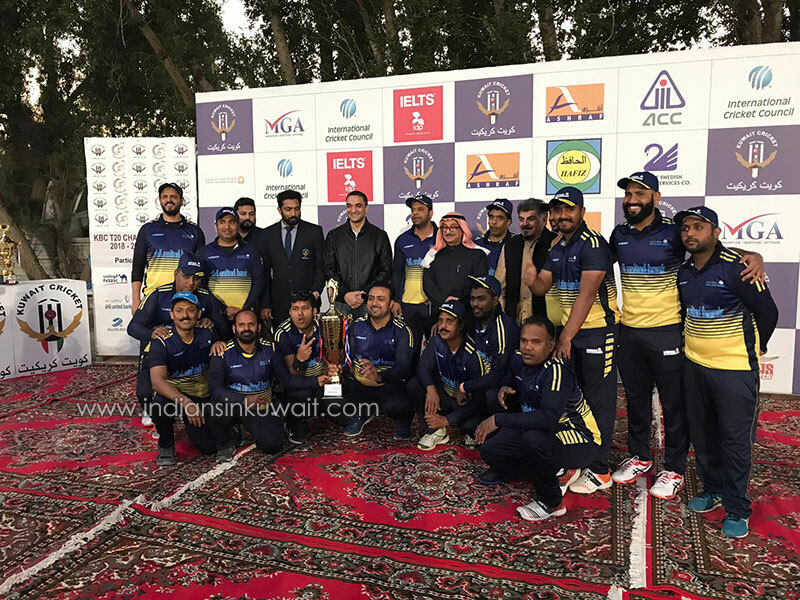 Top banks in Kuwait namely Burgan Bank, AUB, CBK, Gulf Bank, NBK, KFH, Boubyan Bank, Warba Bank, ABK, and KIB participated in the tournament. 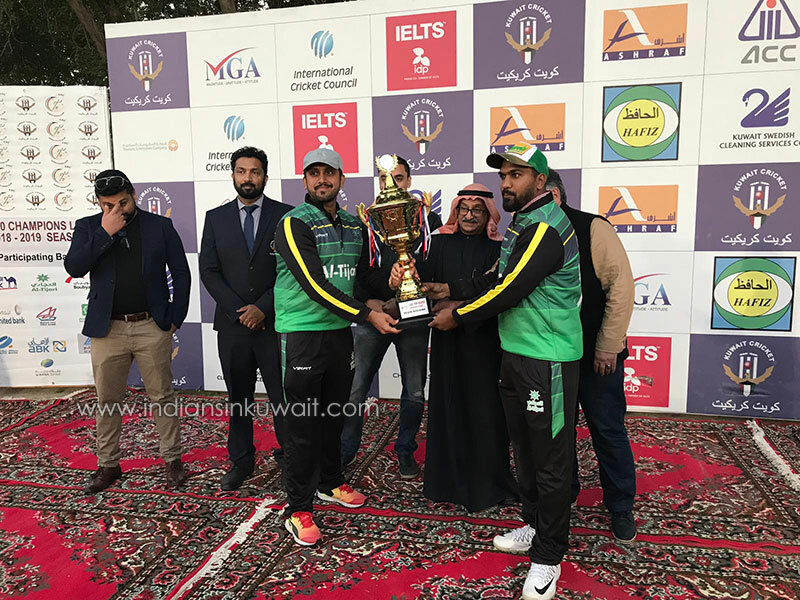 The grand finals along with the presentation ceremony were held at the picturesque Entertainment City ground in a grand style with live commentary and DJ along with snacks. 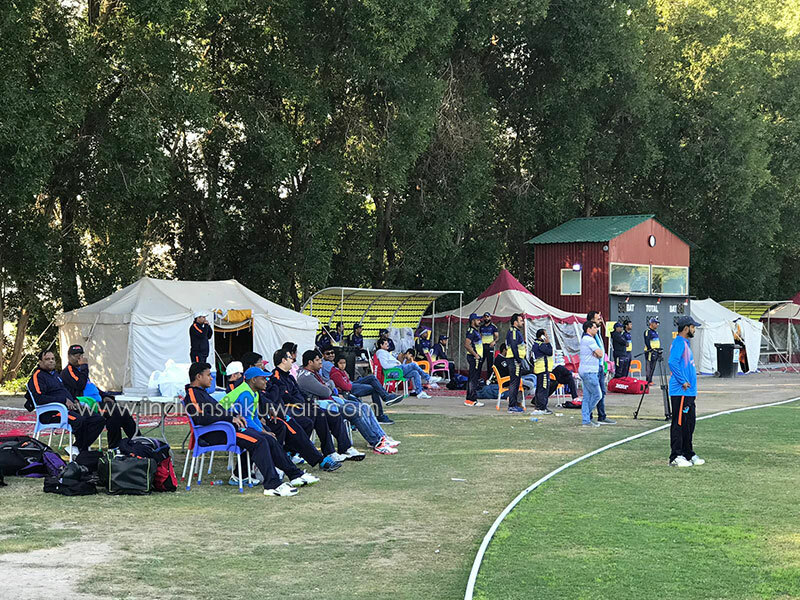 Dignitaries from all the banks witnessed exciting and entertaining matches in a fun filled environment. 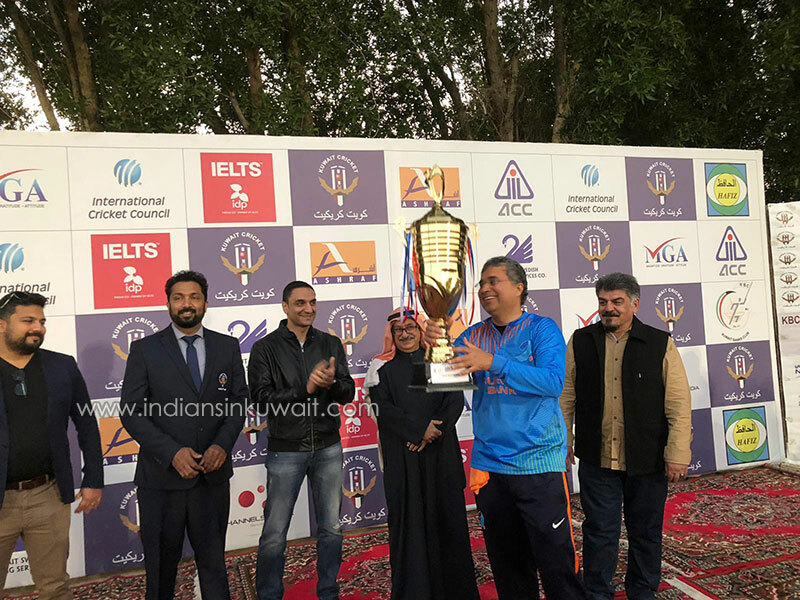 Mr. Hussain (Abu Ali) from the KBC officials graced the occasion with his presence.Kuwait Cricket Council led by Mr. Mahmood Bastaki (Board member and Head of Executive council), Mr. Rishi D Jayan (Director of Seniors Cricket & Operations), Mr. Harshith Vora (Director of Juniors) were also present for the occasion. 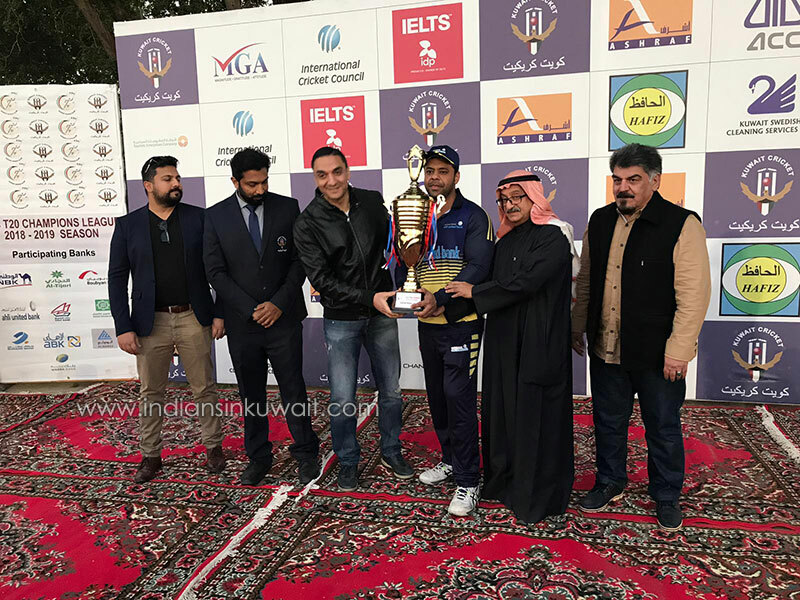 The dignitaries from the KBC and KC council members handed over the trophies for the winners, runners-up and top individual performers of the tournament. Gifts were presented to all team members of the Cup winners Burgan Bank, Cup runners-up AUB and Plate winners CBK. 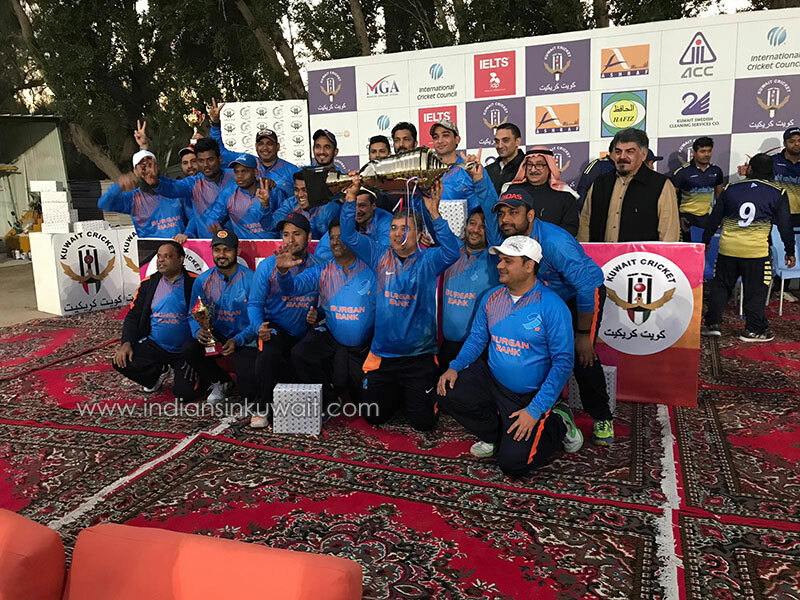 The Cup Finals was played between Burgan Bank and AUB. AUB won the toss and decided to bat first. AUB openers were dismissed cheaply as AUB were 45 for 2 in 7 overs. 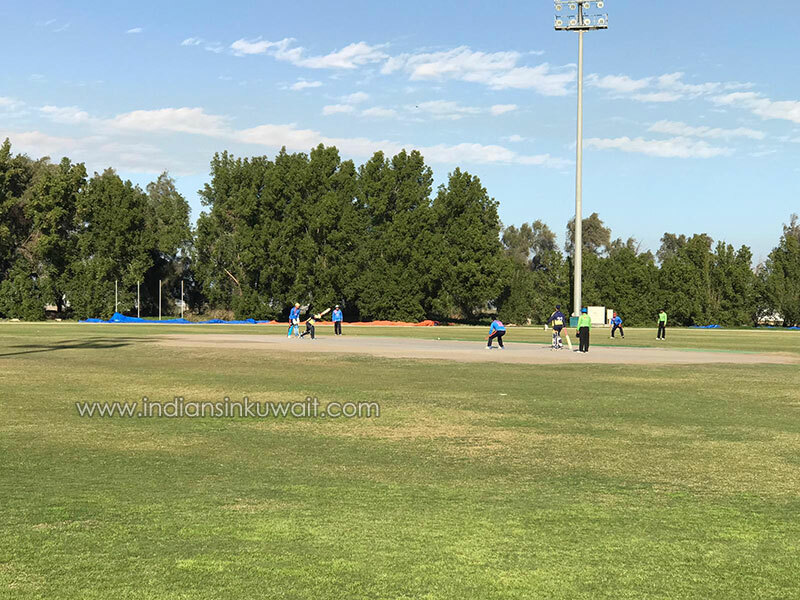 Saud Qamar (52 from 44 balls) and Sibtain Raza (41 of 35 balls) helped AUB to post a modest total of 133. Rubel bowled a good spell of 3 overs picking up 3 wickets conceding only 13 runs. Chasing a target of 134 Burgan started briskly as Wendar Bhoteju and Srinath Janardhanan scored 60 runs in the opening 5 overs. Bhoteju continued to score a fine 69 in just 27 balls and Burgan chased the target in 13.1 overs with 5 wickets to spare. 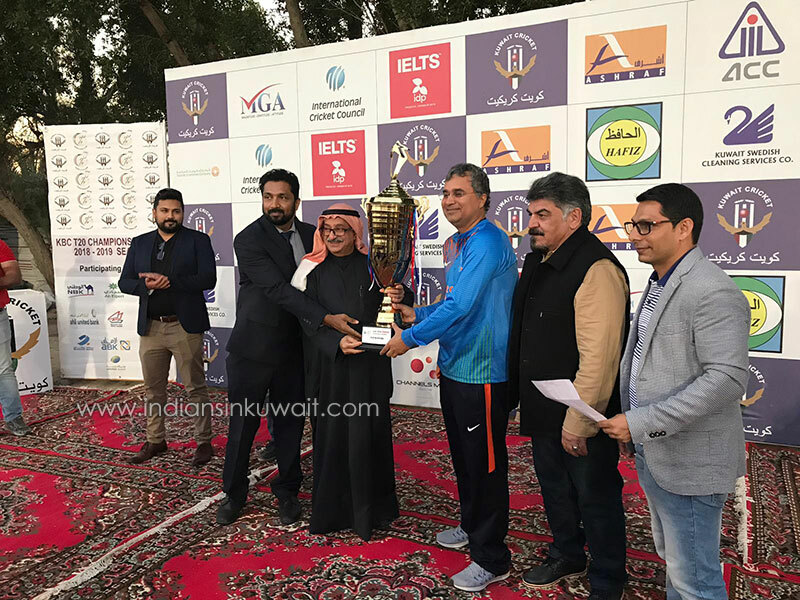 The plate finals was played between Gulf bank and CBK. Gulf Bank Won the toss and elected to bat. They got off to a good start scoring 19 runs in the first 2 overs but lost skipper Mohammad Waleed in the third over. 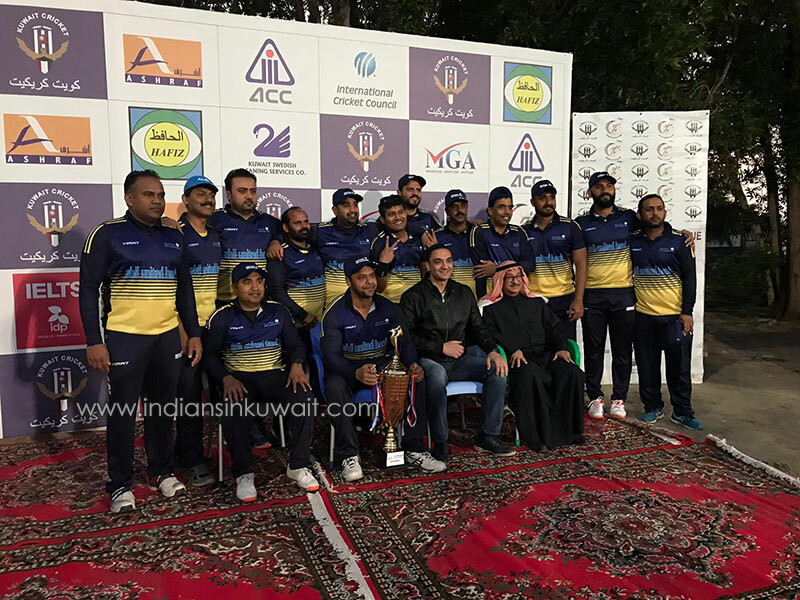 On the back of fine innings by Albdul Munaf (53 runs of 49 balls) and Bilal maqsood (39 of 28 balls), Gulf bank posted a target of 147 for CBK to chase. 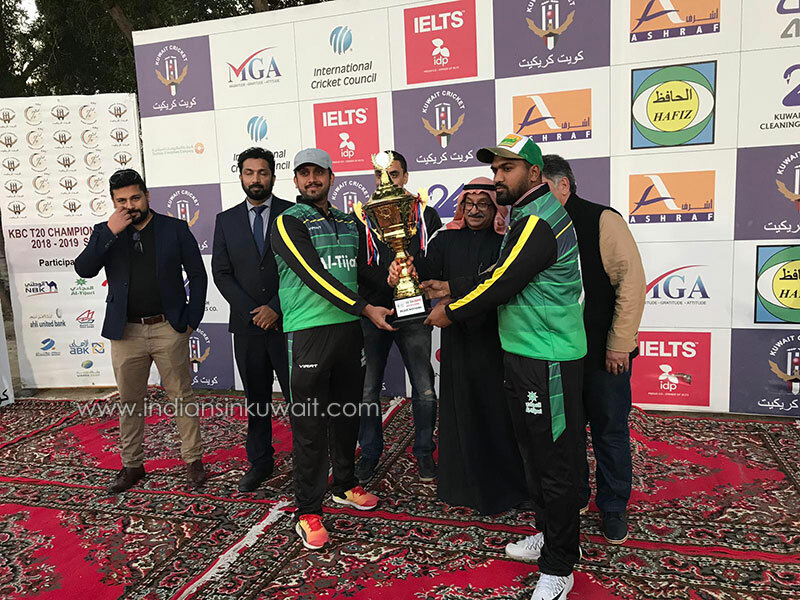 Skipper Shadab Abdulla picked up 3 wickets and Mohammad Nawaz ran through the lower order and picked up 5 wickets. 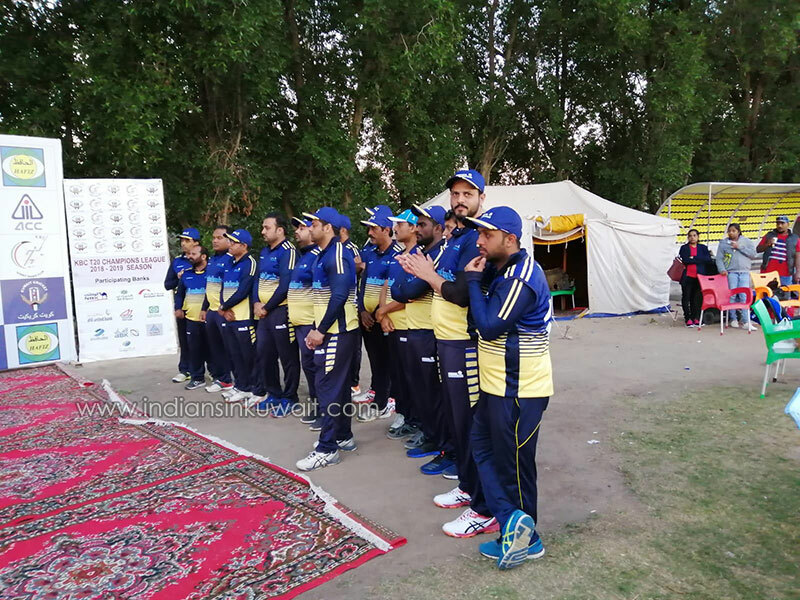 CBK got a good start by scoring 35 runs in 3 overs. Nadim Hanif picked up important wicket of Diju Xavier. 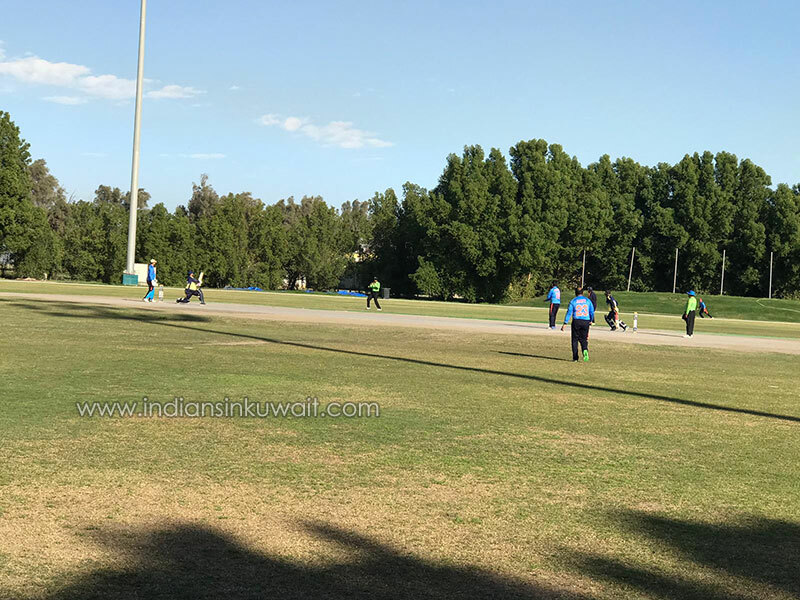 However a fine innings by Ilyas Ahmed (46 not out from 34 balls) saw CBK through even though Gulf bank tried to claw back by picking up 4 wickets in quick succession towards the end. Muhammad Nawaz was Man of the match.